This was originally written for my dad, an intelligent guy who was utterly baffled about the cryptocurrency world. The aim was to be extremely concise, giving a broad overview of the industry and some popular coins while staying non-technical. Ledgers Each node on a blockchain network has a copy of every transaction, which enables a network of trust that eliminates fraud. “Miners” comprise the infrastructure of a blockchain network. They are monetarily incentivized to add computing power to the network, simultaneously securing and processing each transaction. Cryptos act like digital cash-- they require no third party to transact and are relatively untraceable. Unlike cash, you can back them up. Transactions are processed cheaply and instantly, anywhere on Earth. Using cryptos, an African peasant and a San Francisco engineer have the same access to capital, markets, and network services. Blockchains are predicated on the same cryptographic technology that secures your sensitive data and government secrets. They have passed seven years of real-world penetration testing with no failures. The first cryptocurrency. As with first movers in any technology, there are associated pros and cons. Bitcoin has by far the strongest brand recognition and deepest market penetration, and it is the only crypto which can be used directly as a currency at over 100,000 physical and web stores around the world. In Venezuela and Zimbabwe, where geopolitical events have created hyperinflation in the centralized fiat currency, citizens have moved to Bitcoin as a de facto transaction standard. However, Bitcoin unveiled a number of issues that have been solved by subsequent cryptos. It is experiencing significant scaling issues, resulting in high fees and long confirmation times. The argument over potential solutions created a rift in the Bitcoin developer community, who “forked” the network into two separate blockchains amidst drama and politicking in October 2017. Potential solutions to these issues abound, with some already in place , and others nearing deployment . Bitcoin currently has the highest market cap, and since it is easy to buy with fiat currency, the price of many smaller cryptos (“altcoins”) are loosely pegged to its price. This will change in the coming year(s). Where Bitcoin is a currency, Ethereum is a platform, designed as a foundational protocol on which to develop decentralized applications (“Dapps”). Anyone can write code and deploy their program on the global network for extremely low fees. Just like Twitter wouldn’t exist without the open platform of the internet, the next world-changing Dapp can’t exist without Ethereum. Current Dapps include a global market for idle computing power and storage, peer-to-peer real estate transactions (no trusted third party for escrow), identity networks for governments and corporations (think digital Social Security card), and monetization strategies for the internet which replace advertising. Think back 10 years to the advent of smartphones, and then to our culture today-- Ethereum could have a similar network effect on humanity. Ethereum is currently the #2 market cap crypto below Bitcoin, and many believe it will surpass it in 2018. It has a large, active group of developers working to solve scaling issues, maintain security, and create entirely new programming conventions. If successful, platforms like Ethereum may well be the foundation of the decentralized internet of the future . Ripple is significantly more centralized than most crypto networks, designed as a backbone for the global banking and financial technology (“fintech”) industries. It is a network for exchanging between fiat currencies and other asset classes instantly and cheaply, especially when transacting cross-border and between separate institutions. It uses large banks and remittance companies as “anchors” to allow trading between any asset on the network, and big names like Bank of America, American Express, RBC, and UBS are partners. The utility of this network is global and massive in scale. It is extremely important to note that not all cryptos have the same number of tokens. Ripple has 100 Billion tokens compared to Bitcoin’s 21 Million. Do not directly compare price between cryptos. XRP will likely never reach $1k, but the price will rise commensurate with its utility as a financial tool. In some sense, Ripple is anathema to the original philosophical vision of this technology space. And while I agree with the cyberpunk notion of decentralized currencies, separation of money and state, this is the natural progression of the crypto world. The internet was an incredible decentralized wild west of Usenet groups and listservs before Eternal September and the dot-com boom, but its maturation affected every part of global society..
Cardano’s main claim to fame: it is the only crypto developed using academic methodologies by a global collective of engineers and researchers, built on a foundation of industry-leading, peer-reviewed cryptographic research. The network was designed from first-principles to allow scalability, system upgrades, and to balance the privacy of its users with the security needs of regulators . One part of this ecosystem is the Cardano Foundation, a Swiss non-profit founded to work proactively with governments and regulatory bodies to institute legal frameworks around the crypto industry. Detractors of Cardano claim that it doesn’t do anything innovative, but supporters see the academic backing and focus on regulation development as uniquely valuable. Stellar Lumens and Ripple were founded by the same person. They initially shared the same code, but today the two are distinct in their technical back-end as well as their guiding philosophy and development goals. Ripple is closed-source, for-profit, deflationary, and intended for use by large financial institutions. Stellar is open-source, non-profit, inflationary , and intended to promote international wealth distribution. As such, they are not direct competitors. IBM is a major partner to Stellar. Their network is already processing live transactions in 12 currency corridors across the South Pacific, with plans to process 60% of all cross-border payments in the South Pacific’s retail foreign exchange corridor by Q2 2018. Beyond its utility as a financial tool, the Stellar network may become a competitor to Ethereum as a platform for application development and Initial Coin Offerings (“ICOs”). The theoretical maximum throughput for the network is higher, and it takes less computational power to run. The Stellar development team is highly active, has written extensive documentation for third-party developers, and has an impressive list of advisors, including Patrick Collison (Stripe), Sam Altman (Y Combinator), and other giants in the software development community. Iota was developed as the infrastructure backbone for the Internet of Things (IoT), sometimes called the machine economy. As the world of inanimate objects is networked together, their need to communicate grows exponentially. Fridges, thermostats, self-driving cars, printers, planes, and industrial sensors all need a secure protocol with which to transact information. Iota uses a “Tangle” instead of a traditional blockchain, and this is the main innovation driving the crypto’s value. Each device that sends a transaction confirms two other transactions in the Tanlge. This removes the need for miners, and enables unique features like zero fees and infinite scalability. The supply of tokens is fixed forever at 2.8 * 1015, a staggeringly large number (almost three thousand trillion), and the price you see reported is technically “MIOT”, or the price for a million tokens. The most successful privacy-focused cryptocurrency. In Bitcoin and most other cryptos, anyone can examine the public ledger and trace specific coins through the network. If your identity can be attached to a public address on that network, an accurate picture of your transaction history can be built-- who, what, and when. Monero builds anonymity into the system using strong cryptographic principles, which makes it functionally impossible to trace coins, attach names to wallets, or extract metadata from transactions. The development team actively publishes in the cryptography research community. Anonymous transactions are not new-- we call it cash. Only in the past two decades has anonymity grown scarce in the first-world with the rise of credit cards and ubiquitous digital records. Personal data is becoming the most valuable resource on Earth, and there are many legitimate reasons for law-abiding citizens to want digital privacy, but it is true that with anonymity comes bad actors-- Monero is the currency of choice for the majority of black market (“darknet”) transactions. Similarly, US Dollars are the main vehicle for the $320B annual drug trade. An investment here should be based on the underlying cryptographic research and technology behind this coin, as well as competitors like Zcash. Zero fees and instantaneous transfer make RaiBlocks extremely attractive for exchange of value, in many senses outperforming Bitcoin at its original intended purpose. This crypto has seen an explosion in price and exposure over the past month, and it may become the network of choice for transferring value within and between crypto exchanges. Just in the first week of 2018: the CEO of Ledger (makers of the most popular hardware wallet on the market) waived the $50k code review fee to get RaiBlocks on his product, and XRB got listed on Binance and Kucoin, two of the largest altcoin exchanges globally. This is one to watch for 2018. Developed as a single answer to the problem of supply-chain logistics, VeChain is knocking on the door of a fast-growing $8 trillion industry. Every shipping container and packaged product in the world requires constant tracking and verification. A smart economy for logistics built on the blockchain promises greater efficiency and lower cost through the entire process flow. Don’t take my word for it-- VeChain has investment from PwC (5th largest US corporation), Groupe Renault, Kuehne & Nagel (world’s largest freight company), and DIG (China’s largest wine importer). The Chinese government has mandated VeChain to serve as blockchain technology partner to the city of Gui’an, a special economic zone and testbed for China’s smart city of the future . This crypto has some of the strongest commercial partnerships in the industry, and a large active development team. Here I expand on my response to this Reddit comment, replying to the assertion that 3D printing will never be a viable commercial option. Am I biased as hell? Yes, I work in the industry and believe in the achievable potential of the technology. Still, this is an accurate picture of the industry. FYI, your post is about 10-15 years behind the state of the art in additive manufacturing. In plastics, serial production has been underway for over a decade. If you fly on any relatively new airplane, the majority of the air ducting and multiple other non-critical parts were printed, probably using LS (laser sintering). Boeing recently released their standard for FDM (fused deposition modeling, the type you're used to in desktop printers), and intend to use that for a multitude of non-critical components. In metals, we've been able to produce fully dense parts, highly accurately, with much better mechanical properties than casting, for years. We use powder-bed processes similar to LS, called DMLS/SLM/EBM/DMLM depending on the company, for stainless steels, aluminum, titanium, nickel superalloys, coppers, and other esoteric alloys. The shift from prototyping to production in metals has been occurring slowly over the past 3-4 years, mostly driven by aerospace and energy-generation. The entire military industrial complex, along with their suppliers and vendors, are currently engaged in qualifying the materials, specifications, and standards for printing critical components in planes, rockets, missiles, ships, jet engines, all manner of turbomachinery, and many more applications. Additive manufacturing will never be used for paperclips-- but digital inventory management is incredibly attractive to large companies. Combined with the potential for part consolidation and geometric complexity, along with incredibly short lead times and lack of tooling, additive technologies begin to surpass traditional options for production (especially investment casting) both technically and economically. Neither is better. They are different. Android is a more open platform, allowing you to run applications from outside the app store. The file system is also open-- meaning you can plug it into any computer and it will act like a USB drive or external hard drive. While this openness creates choice in the market and drives innovation, it comes at a cost, which is optimization and security. Since many different hardware manufacturers make Android phones (summed, more than iPhones), the software landscape is extremely fragmented, with multiple versions of Android, running multiple OEM skins, on multiple devices. Compare that to Apple, which is entirely vertically integrated-- they design the chipset, hardware, software, everything. iOS is extremely optimized for their A series chipset (which, by the way, utterly destroy the Qualcomm chips used in Androids). Fragmentation mean vulnerabilities are harder to patch and easier to exploit. On security, Apple wins, with no caveats. Every current generation iPhone is hardware encrypted by default, while less than 10% of Android phones are secure. On voice recognition, Google's Assistant is significantly better than Siri. iOS still doesn't have homescreen widgets! It's worth pointing out price difference-- you pay a premium for an iPhone. Google's Pixel phones are similarly expensive, but there is an entire world of cheaper Android phones to choose from. At the end of the day, most of the differences between platforms have disappeared. In their UI and UX they are highly similar. I choose Android for its modularity, choice of hardware, homescreen widgets, and better voice recognition. In response to "Why do intelligent people no longer care about art?" Based on the comment I wrote in response to Michael Lind's article, Artless: Why do intelligent people no longer care about art? Reading it first might help. Any examples I've used here link directly to the artist's website. Please click through and check out their stuff. While that is the classical definition, it seems to me such an antiquated view I'm shocked it wasn't elaborated. How do you define painting? Does digital painting fall into this narrow category? 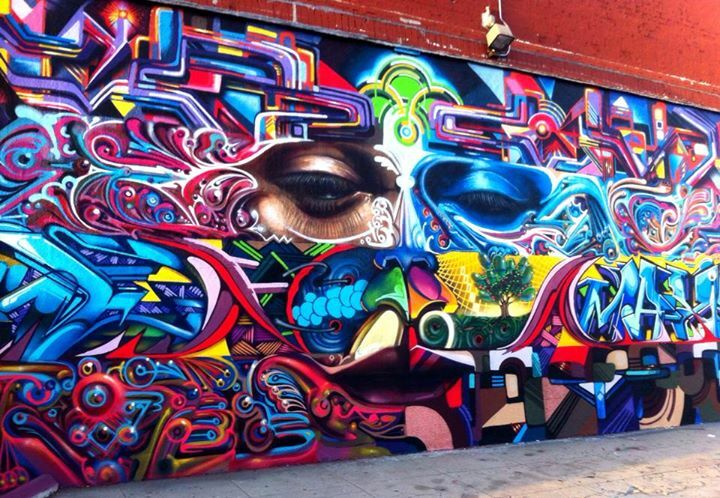 What about graffiti, street art, or stencil painting? "Post-apocalyptic San Francisco - The Underlife", Digital Painting. 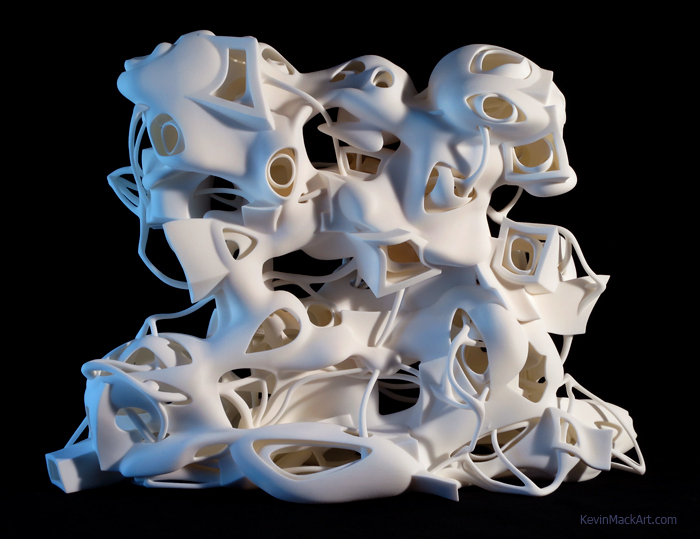 What about sculpture-- does digital modeling and 3D printing count? 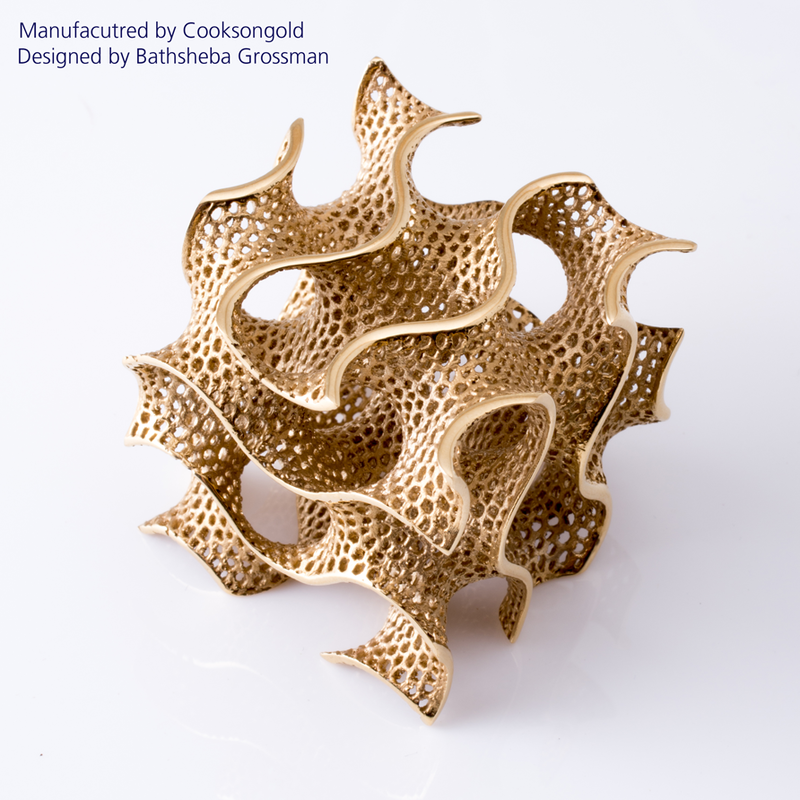 My [former] university printed some gorgeous pieces for a symposium last year, and they were never touched by a human hand. Artistic creativity is increasingly expressed digitally, extruded into the physical world not through the labor of a sculptor's workshop, but by engineered automation. Are the following works somehow less "fine" because of that? I see in Grossman's work the beauty of mathematics expressed visually. How does one define "popular music"? Before the internet this was just the music playing on the radio. Now, with the splintering of music genres and digital distribution platforms, there are artists selling out tours you and I have never heard of. In terms of "symphonic" music, I love the work of Simon Green a.k.a Bonobo, whose compositions weave intricate layers of electronic and instrumental samples into tapestries of downtempo sound. He literally tours with a 20 person orchestral ensemble. Is his music less fine because he stands behind a mixdeck? What about dance-- does hip-hop count? Breakdancing? Finger tut, krump, or pole dancing? How do you categorize a production that combines the traditional "fine" forms of dancing with modern and jazz? Hamilton is one of the most wildly successful Broadway productions of all time-- is it less fine because the music is largely rap? This is criticism of the decentralization of the art world, not the lack of interest in art itself. So there's no longer a single place from which the bourgeois draw their dinner conversation-- /r/Art has over 3 Million subscribers [7/17/17: over 11 Million]. Deviantart is bursting with young artists of every medium. Art.ly has been massively successful bringing (the author's definition of) fine art into the 21st century. I'm sure there are blogs and websites devoted to the type of art scene criticism Lind is talking about here, but probably not a single elevated source. I don't understand-- is this not how the art world has always operated? Maybe I'm revealing my age here, but as far as I know the art world has always operated by the fiscal whims of the extremely rich, even if "the American gentry" were able to discuss those whims intelligently. If anything, crowdfunding platforms like GoFundMe and Patreon have made the art world less insular and less marginal. My ability to find and fund artists that I appreciate is far easier today than at any point in human history. The opinions of the very few art buyers and critics of the world are no longer the sole source for artistic information and criticism. 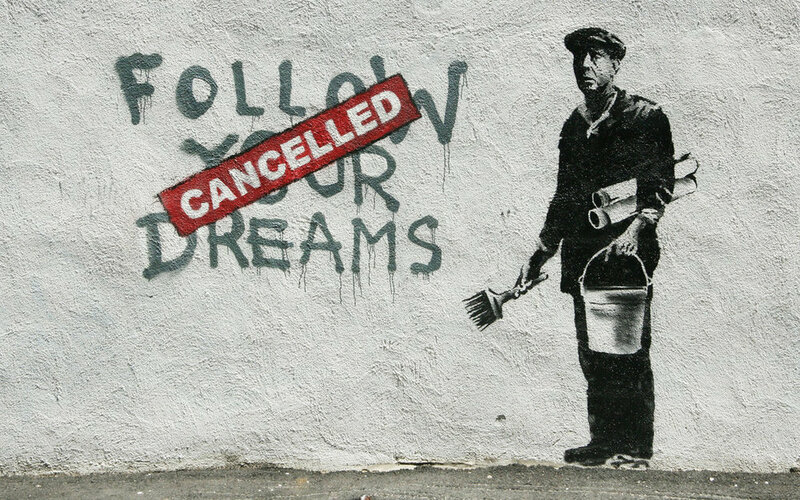 Indeed, they no longer control the avenue for success in art-- the internet has enabled the artist to connect directly with their potential customer. In short, I think what has been lost in the art world is not interest, but control. Control of what is considered "fine" in art, control of the means of exposure, and control of the methods of distribution. This /r/theydidthemath Reddit thread asks how much weight each bracket holds in the photo below. During graduate school I spent long periods of time waiting on data acquisition and goofing off in the lab. The following video is the ~hour long process of simulating this scenario using Solidworks, in a display of incredibly unnecessary technical work. This could be reduced to a relatively simply force-body diagram by a clever person (who wasn't looking for excuses to procrastinate). It was clear that some posters were making faulty assumptions to simplify the problem. The cross-sectional area of a bottle is not linear along its height, so it's not a linear mass relationship along the shelf. The group of bottles also have a different center of mass than the group of liquid. My assumptions: bottle wall thickness, material densities of the liquid, glass, and shelf, and support width. Most importantly, I assumed that the bottles only act on the shelf-- they aren't sliding down and acting on one another. In essence, I'm assuming the strength of static friction between the bottles and shelf is high enough to hold them in place at this angle. Conclusions: The left support holds ~40% and the right support holds ~60%. In my simulation I'm finding 11.98N and 17.8N reaction forces for the two supports. Download these files on Thingiverse. The seed of this project was my discovery of the fantastic portfolio of Geoffrey Marchal, who uses photogrammetry to scan sculptures, fossils, and other works of art and history into usable solid models. You can find his work on MyMiniFactory or SketchFab. I also read Neil Gaiman's Norse Mythology when it was released (highly recommended), so mythology was on the mind. Besides his ferocious cave bear skull, it was the horse skull that drew me in. The scan resolution is great, but the bottom surface required some heavy clean-up. My background is in Solidworks parametric modeling, and I'm still working on Blender mastery. Most of this was done in Meshmixer and Materialise. 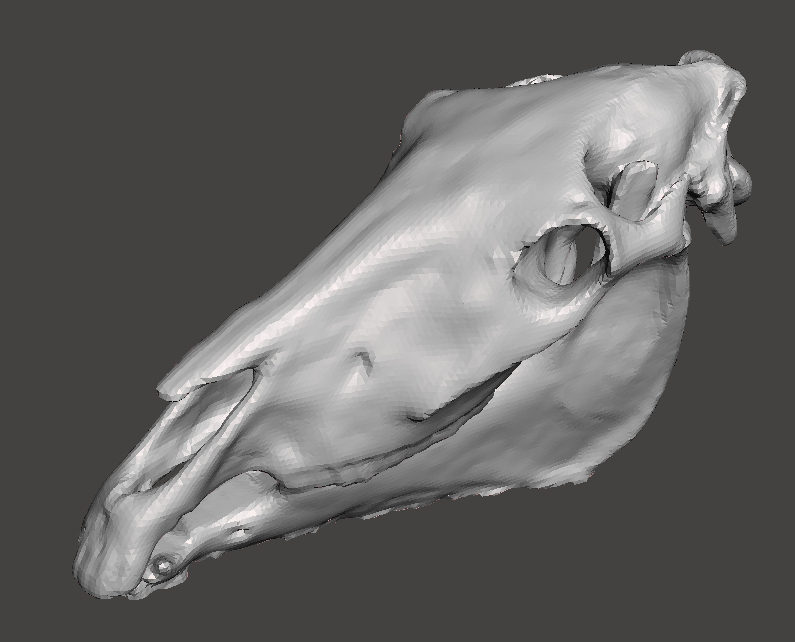 Next: adding a Unicorn skull, and printing this thing out. Don't worry, I referenced the right archaeology research and this is a completely accurate representation. I initially printed the horn separately and attached afterwards to reduce the cost and time of printing. This is a standard ABS print on a Makerbot-style filament printer. and scaled to roughly 5 in. long. Build lines evidencing the two different build orientations are evident in the last photo. Ideally I would have smoothed these out using the acetone method, but I was a bit pressed for time. A quick shot of filler primer and some paint was all these got. Two chrome, two gold. Apply some creative #outrun style lighting, and you get these weird images. The plastic versions are great, but these were designed to be printed in metal. Directly printing metal requires significantly more preparation than polymer. The extreme energy input required to melt metal powder creates enough thermal stress that parts can warp or fail completely. To combat this effect we have to connect the part to its build plate, and build support structures for each downward facing surface. Read more about that [in this article I have yet to write]. At this scale, designed correctly, these supports can be removed fairly easily with pliers and care. The support evidence is then cleaned up with a rotary tool and a suite of attachments. I left one in the as-built condition, one after a media-blast, and polished one one on a buffing wheel. Note the slight coloration effect on the surface of the as-built part. From left to right: Polished, as-built, media blasted.